A well-prepared, qualified job seeker can increase their likelihood of landing the job by avoiding the following behaviors employers hate. Employers are spammed by unqualified and marginally qualified people who apply for each posted job. Yet, reviewing every resume, hoping for a gem, the interesting applicant who doesn’t quite fit the hiring profile is critical to find superior employees. So, the employer is stuck evaluating them all; and this means - they are all gone - in 30 seconds. If the job seeker fails to follow instructions, their application may never reach the people with the power to hire. Failure to answer questions about salary requirements, for example, may relegate their application to the “no” pile. Their resume and cover letters contain typos, grammatical errors, incomplete thoughts, portions copied and pasted from prior applications to different employers, and details not requested for the current job. Recently, a governmental employer added the caveat that applications mailed in stationery belonging to the current employer would not be considered. The same applies to emailed applications from the current employer’s address. In a recent SHRM study, 64% of HR professionals did not extend a job offer to a potential employee because their background reference check showed inaccurate dates of previous employment. Lies that are purposeful or lies that omit facts and blur details will haunt a job seeker. 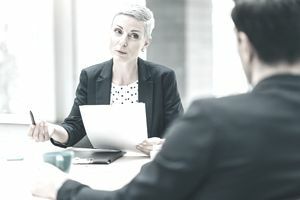 Commonly, employers consider lying on application materials grounds for dismissal – even years after the employee was hired. Employers may dig deeply to check the accuracy of applicant credentials such as claimed degrees. This makes the job seeker seem unprepared. It holds up the employer's background checking process if the job seeker is a viable candidate. Companies often use the application as a literacy screen so taking the application home is not an option. In any case, employers can take no action until they have a completed and signed application that gives permission for reference checks. Plus, the job seeker’s signature attests to the veracity of the information provided. Especially if you have been asked to arrive early to fill out the application – and most employers do – this lack of preparation is unacceptable. In one recent interview for a software development company, the job seeker hadn’t visited the company website or become familiar with the products. How can a job seeker tell an employer how well he or she will fit the job and the company when the applicant didn’t even visit the website? In fact, how can the job seeker even apply? This is hardly the face to present to a potential employer. And, it speaks volumes for potential job performance. Or, the note says, “I can’t vouch for this person, but someone I know recommended him.” Rest assured, if a current employee is enthused about a candidate, the “right” people know. And, the job seeker doesn’t risk irritating HR staff who move qualified applicants on through the review process. HR has a name for candidates whose calls, emails, and visits interrupt work and steal time and attention from overworked staff. They call them “stalkers.” These job seekers gain no points with the hiring decision-maker. Why would any serious job candidate blow their chances so badly when their foot is already in the door? Job searchers arrive late, dress improperly, reek of cologne, and sport dirty fingernails. They are unprepared to answer predictable questions. They chew gum, take calls on cell phones, and forget the items they need in their cars. One interviewee asked the employer the name of the company where he was interviewing; he said he forgot to read the sign on his way in. Another asked an interviewer if she wanted to see his belly scar to verify a boat accident as the reason for his unemployment. Smart employers notice and make appropriate hiring decisions. They arrive late, fail to follow instructions, bombard employers with emails and calls, and talk down to lower level employees. Employers should consider courtesies such as thank you letters when making a hiring decision. Candidate behaviors do reappear in the workplace.